When a child is first born, after the washing and swaddling, the baby is usually presented to the mother, and almost in every case, the small child instinctively searches for their mother’s milk. Why? Because even a baby knows that the nourishment provided by food is critical for its health and survival. This axiom never changes throughout the course of our lives, regardless of how long or short our lives may be. And while we may not be always consciously aware of food’s importance, our subconscious is. Access to food and its nourishment is never far from our mind’s eye. Food is the daily medicine we all need to be healthy, providing each of us the energy and vitality to live and thrive. Unfortunately, for too many older and disabled adults, access to food — and to the right foods — is more difficult than one would imagine. It is not because there is not enough food in this country; American farms, especially right here in Maine, produce some of the most incredible healthy foods to sustain our lives. To be clear, I am not talking about food shortages but food access, which includes the local availability of healthy foods, the ability to travel to shop for healthy foods, the affordability of healthy foods, and the ability to prepare healthy food for a meal. Many older and disabled adults — our neighbors — face great barriers, such as chronic disease, limited transportation options, and poverty that affect their accessing healthy food. Subsequently, their food insecurity negatively affects their health. They begin to lose the energy and vitality needed to live and thrive. And the negative fiscal impact to the community is staggering; limited access to healthy foods results in repeated and costly hospitalizations that could have been avoided, as well as early entry into expensive long-term care facilities. Access to healthy foods — nature’s medicine — needs to be more available. In Maine, the five Area Agencies on Aging and their partners help address food insecurity for older and disabled adults through Meals on Wheels. Meals on Wheels is partially funded by the federal government, and our state government contributes $200,000 annually. 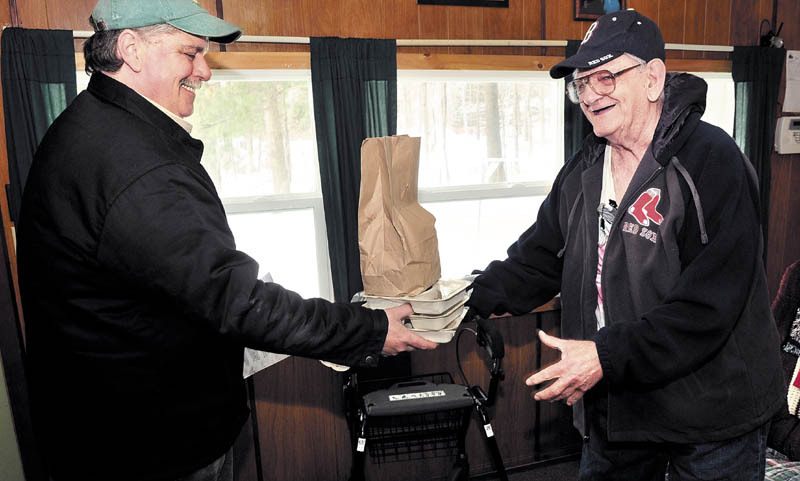 Combined, the Maine Area Agencies on Aging fundraise more than $1.3 million for Meals on Wheels, and more than 1,100 volunteers donate nearly 65,000 hours to keep the cost of this service to a minimum. In 2017 this resulted in Maine Area Agencies on Aging serving 572,470 meals to 4,758 older and disabled adults. But we still didn’t meet the entire need. As we start 2018, there is a 257-person wait list statewide for Meals on Wheels, and that is expected to grow to more than 300 by year end. Can we do more? Yes, we can — and we really have no other choice. Already health systems are recognizing how important access to healthy food is for the well-being of older and disabled adults. Food is clearly preventative medicine and access to it provides for better quality health outcomes, reduced health care costs and most importantly, improves quality of life. A recent example of this new thinking comes from Mid Coast-Parkview Health, which donated the funds to eliminate the Meals on Wheels waitlist in their catchment area, providing food for 15 people. Thank you, Mid Coast-Parkview Health. But a more sustainable and dependable solution is needed. Rep. Scott Hamann, D-South Portland, has sponsored a bill, L.D. 692, to add $500,000 annually to the state’s contribution to the Meals on Wheels program. This would result in more than 65,000 meals delivered and approximately 520 more older and disabled adults having access to healthy food each year. This monetary increase would not only immediately eliminate the wait list, but also would improve the ability of the aging agencies to address the growing need of food access for older and disabled adults for the next two to three years. I strongly encourage people to call their state representative or senator and urge they vote yes on L.D. 692, and help increase access to healthy food for older and disabled adults. Gerard Queally is president and CEO of Spectrum Generations, an Augusta-based nonprofit organization that is one of the Area Agencies on Aging.